For 30 seconds, opponents in melee range take 16 points [sic] fire damage per second. Undead up to level 26 flee for 30 seconds. Swim unharmed in freezing cold water. Mara's Wrath is an expert level Destruction spell that surrounds the caster in flames, and deals fire damage every second to hostile targets within melee range, with 1% of the immediate fire damage being dealt over 0.1 seconds. If an undead target is within the area of effect, then they will be demoralized and flee from the caster. Mara's Wrath, determines that damage is dealt in 15 feet per second for 30 seconds; extends the duration of the cloak visual effect for an additional 2 seconds. Flames, deals 16 points of fire damage for 1 second; hostile targets receive a burning effect that lingers, dealing an additional 0.16 fire damage for 0.1 seconds. Turn Undead Fear, demoralizes undead targets up to level 15 for 30 seconds. Intense Flames Fear, demoralizes targets up to level 15 for 15 seconds; if the Intense Flames perk has been unlocked. Resist Freezing Water, grants resistance to freezing cold water for 32 seconds. Aspect of Terror, increases the damage dealt by the Flames effect to 26 points of fire damage, with 0.26 points of fire damage being dealt as additional damage. This perk also raises the level that undead targets can be demoralized by the Turn Undead Fear effect to level 25. 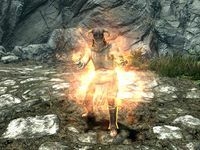 Moreover, it raises the level that targets can be demoralized by the Intense Flames Fear effect to level 25; if both the Aspect of Terror and Intense Flames perks have been unlocked. Augmented Flames (Rank I), increases the damage dealt by the Flames effect to 20 points of fire damage, with 0.2 points of fire damage being dealt as additional damage. This perk also raises the level that undead targets can be demoralized by the Turn Undead Fear effect to level 18. Moreover, it raises the level that targets can be demoralized by the Intense Flames Fear effect to level 18; if both the Augmented Flames (Rank I) and Intense Flames perks have been unlocked. Augmented Flames (Rank II), increases the damage dealt by the Flames effect to 24 points of fire damage, with 0.24 points of fire damage being dealt as additional damage. This perk also raises the level that undead targets can be demoralized by the Turn Undead Fear effect to level 22. Moreover, it raises the level that targets can be demoralized by the Intense Flames Fear effect to level 22; if both the Augmented Flames (Rank II) and Intense Flames perks have been unlocked. Destruction Dual Casting, increases the spell effectiveness by 120% and increases the spell cost by 180%; if dual-casted. This expands the area of the Mara's Wrath effect to 33 feet, and raises the level that undead targets can be demoralized by the Turn Undead Fear effect to level 26. This perk also raises the level that targets can be demoralized by the Intense Flames Fear effect to level 33; if both the Destruction Dual Casting and Intense Flames perks have been unlocked. Necromage, increases the damage dealt by the Flames effect to 20 points of fire damage, with 0.2 points of fire damage being dealt as additional damage. This perk also raises the level that undead targets can be demoralized by the Turn Undead Fear effect to level 18, and extends the duration of the effect to 45 seconds. Despite having a taper duration, no additional damage is dealt, nor are any effects reapplied during these 2 seconds. Only the duration of the cloak visual effect is extended. It is worth noting that Mara's Wrath only affects hostile targets, and will not deal damage to friendly NPCs. Except for NPCs who have the ActorTypeUndead keyword attached and a level that is low enough to be affected by the Turn Undead Fear effect of Mara's Wrath, such as Sybille Stentor, which if true will initiate combat and may result in a bounty for assault. Mara's Wrath has both the MagicCloak and WISpellDangerous keywords attached. This means that the WICastMagic02 and WICommentMagicDangerous hidden quests will trigger when the spell is being cast and when it is active, respectively. This results in nearby bystanders making comments on the magical antics. The Skeletal Dragon cannot be affected by the Turn Undead Fear effect of Mara's Wrath. Unlike Flame Cloak, having Mara's Wrath ready to cast does not ignite flammable gas. Mara's Wrath first appeared in the Spell Tomes official add-on for The Elder Scrolls IV: Oblivion. †Because the magic effect archetype associated with the spell is Cloak, the magnitude determines the area of effect, rather than the damage dealt. So while the area value displayed in the Creation Kit is null, the area of effect is actually 15 feet, by means of the magnitude. Many of the level values associated with this spell are bugged and not as they are described in the game files or the spell description. See the individual hover text for further details. The Resist Freezing Water effect does not work, even with Survival Mode installed and enabled. This page was last modified on 3 November 2018, at 17:22.